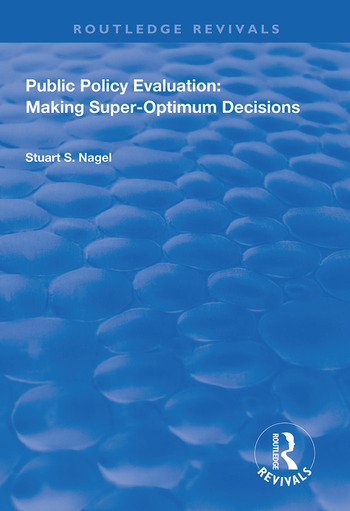 First published in 1998, this volume examines how super-optimum decisions involve finding alternatives to controversies whereby Conservatives, Liberals, or other major groups can all come out ahead of their best initial expectations simultaneously. This book is organised in terms of concepts, methods, causes, process, substance, and the policy studies profession. Concepts clarify that policy evaluation traditionally involves: (1) Goals to be achieved; (2) Alternatives available for achieving them; (3) Relations between goals and alternatives; (4) Drawing a conclusion as to the best alternative in light of the goals, alternatives, and relations; and (5) Analysing how the conclusion would change if there were changes in the goals, alternatives, or relations. Super-optimizing also involves five related steps, but with the following improvements: (1) Goals are designed as conservative, liberal, or neutral; (2) Alternatives get the same designations; (3) Relations are simplified to indicate which alternatives are relatively high or low on each goal; (4) The conclusion involves arriving at an alternative that does better on Goal A than Alternative A, and simultaneously better on Goal B than Alternative B; and (5) The fifth step involves analysing the super-optimum or win-win alternative in terms of its feasibility as to the economic, technological, psychological, political, administrative, and legal matters. Part 1. Concepts, Methods and Causes. 1. What is Policy Evaluation? Conceptual Theory. 2. Methods of Policy Analysis. 3. Across Policy Problems (Cross-Cutting Theory). Part 2. Process and Substance. 4. Government Processes and Structures. 5. Policy Substance. Part 3. Policy Studies Profession. 6. Policy Studies Professionalism. 7. Administering Policy Studies. 8. General Bibliographies.